^ "Windows 95 Installation Requirements". KnowledgeBase Archive. Archived from the original on 20 October 2017. Retrieved 9 June 2018. ^ "Cannot Upgrade Windows 95/98 to Windows 2000 Server". Archived from the original on 4 November 2013. ^ "GP Fault or Fatal Exception Error on Intel MMX CPU". Archived from the original on 20 October 2017. Retrieved 9 June 2018. ^ "Memory Management Problems on Computers with Pentium Processors". KnowledgeBase Archive. Archived from the original on 20 October 2017. Retrieved 9 June 2018. 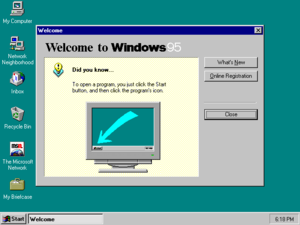 This page is based on the Wikipedia article Windows 95; it is used under the Creative Commons Attribution-ShareAlike 3.0 Unported License (CC-BY-SA). You may redistribute it, verbatim or modified, providing that you comply with the terms of the CC-BY-SA.